There very well may be more stages but here's ten. Power to the bicycle, how green can you get and be fit as well. Wow, where did that huge crowd of people come from?! That is so cool! Cool montage! She looks graceful, as all CPH gals do. this photo made me laugh! 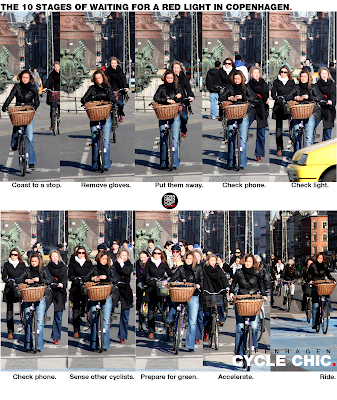 It's funny how all the cyclists are women. It's a very good idea for a photo and well executed. Just a pity all the cyclists look miserable! Though they probably are not. I think they don't look so good because they are headed into the sun. Squinting.